Synopsis: When a young boy falls asleep during school one day, he is transported into a fantasy world of wizards, dragons, quests, and the tale of “The Thirteenth Hour.” In it, a young man named Logan has come of age and must leave the sleepy village orphanage where he was raised to be a soldier in King Darian IV's Imperial Army. Although he finds himself immediately at odds with military life and possesses no special skills (aside from daydreaming) and little self-confidence, Logan’s tour is surprisingly extended when he is picked by the King’s wizards to be specially trained as an Imperial Ranger for a mysterious quest to find the secret to eternal life. As he slowly grinds through training, he begins to discover there is more to himself than he realizes. 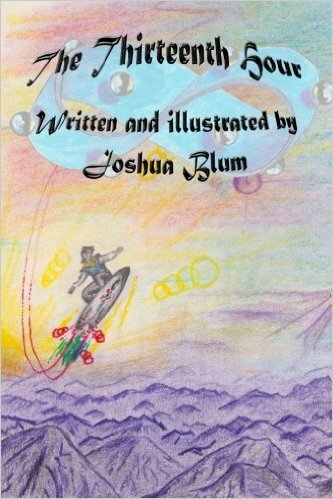 When he and his teammates embark on their quest, disaster soon strikes, and Logan experiences not only the panic of being shipwrecked, marooned, and bereft of all supplies but also the excitement and challenge of an epic adventure he had previously only thought possible in books, daydreams, and fairy tales. Along the way, he is reunited with his best friend from childhood, Aurora, who joins him on his quest (and provides the occasional female perspective, as the story is sometimes told from her point of view). Their journey spans many months, a variety of dangers, and four corners of the known world. But in the end, they find that no matter how exotic the locale, one is never far from those big questions we all ask ourselves at some point – the ones about chasing dreams, conquering fear, and living a life worth living. Review: This is an excellent fantasy story that I could just not stop reading. I would recommend this book to anyone who loves to get lost in an excellent fiction story. I found it really easy to get lost in this book and could read it over and over again.